The Chinatown of Calcutta (Kolkata) goes back to the late eighteenth century when a Chinese trader, Tong Achew settled close to present day Budge Budge. 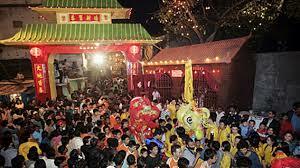 The Chinatown is partitioned into two parts, Old Chinatown (Tiretta Bazar) and New Chinatown (Tangra). Chinese Breakfast is served in Tiretta Bazar in Central Kolkata each morning.